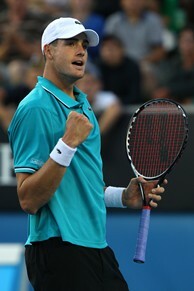 John Isner celebrates following his second-round win over David Nalbandian. MELBOURNE, Australia -- If there is a chance to play a dramatic five-set match at a major, count Wimbledon folk hero John Isner in. But if there is a way to let go of a critical match at a major, count the North Carolina native out. Last year at the Aussie Open, Isner went down to Marin Cilic, 9-7, in the fifth set. On Wednesday in Melbourne, he pulled off a 4-6, 6-3, 2-6, 7-6, 10-8 victory over former Wimbledon finalist David Nalbandian. The match might be remembered for a controversy at 8-8 in the fifth set, when the Argentine was denied an opportunity to challenge an overrule on an Isner first serve at break point, but as Nalbandian said later, that didn't decide the outcome. It was decided by Isner's willingness to stay the course minute after minute in a four-hour, 14-minute match against an all-court player who was on his game. Unlike against Cilic, he stepped up in the contest's decisive points. "I think I played the big points better," said the U.S. Davis Cupper. "I told myself I didn't want to repeat that effort. I wanted to actually win this one. I think I was going for my shots more. For two, three hours of that match, I felt like he was just too solid for me. Only thing that was keeping me in was my serve, obviously. From the back of the court, he was just not missing much and playing aggressively and really well. I knew he was capable of that. I was hoping he wasn't going to pull it out. I was hanging by a thread, but I kept pulling even with my serve, and I was going for my shots. Eventually it paid off." It is unlikely that anything lengthwise will ever top Isner and Frenchman Nicolas Mahut's record-breaking three-day marathon at 2010 Wimbledon won by the American, 70-68, in the fifth set in 11 hours, five minutes. It was a match that was talked about throughout the rest of the summer and is something that will forever remain part of tennis lore. His win over Nalbandian wasn't as physically taxing, but it was over a former top-five player who once gave hell to the legendary Roger Federer. But like he did against Mahut, the 6-foot-9-inch Isner was able to put his serve on autopilot and bomb ace after service winner. "I think one thing that helps me is my service motion. I feel like it's pretty natural," he said. "So even when I'm tired and my legs really aren't underneath me, I'm able to still get free points on my serve and make a lot of first serves and whatnot. When it gets to a point when I'm running on fumes, it's just serve and forehand, hit it as hard as I can." Isner loves the big moments, but what he likes more is succeeding in the huge matches against elite players when a lot is on the line. On the Australian Open's third main court, Margaret Court Arena, which is arguably the most fun place in Melbourne to watch a match because of its intimacy, Isner has been a drama king. The full house was roaring during his match against Nalbandian, like they were in the Cilic match, and they were when he took out Gael Monfils two years ago, when Isner won the match and he imitated the Superman celebration technique of his favorite NFL player, Panther quarterback Cam Newton. "The crowd, they're right on top of you," he said. It's not the biggest stadium, but it's always packed. It's just a lot of fun. It's really loud. You want to give it your all there, and that's what both of us did in front of that crowd." Isner called the victory a gut check. After his loss to Cilic last season, he lost control of his game and only reached two quarterfinals through Wimbledon. He wants to play Davis Cup against Switzerland away next month, and he showed a former Australian Open champion a lot with his effort. "If Captain Courier decides to put me in, it would give me confidence for that," he said. "It's huge. I want to keep on winning." Isner's next opponent is pretty familiar to U.S. fans: Spanish serve-and-volleyer Feliciano Lopez, who took down Andy Roddick at Wimbledon and then Mardy Fish in the U.S.'s Davis Cup loss in Austin shortly after that. But 16th seed Isner bested the Spaniard a few months ago at the Paris Indoors. Lopez does not return anywhere near as well as Nalbandian, so Isner should be able to hold serve a little easier. But he's going to have to return very well and get his passing game going. He's been working hard on improving his all-around game, and he has developed a little more pop on his backhand and is volleying more efficiently, but against a rushing Lopez, returning will be put at a premium. "I can take that match," Isner said. "I think I will have some confidence from [when I beat him last]. But he's tough, lefty, and he can do a lot with his serve and a lot with his slice backhand, and he's aggressive. It will be a fun match, for sure."